In the 1700s, Port Credit was home to the Mississaugas, who used the river, which they called Missinhe or “trusting creek,” as a place for meeting with white traders. The French and later the English called the area Port Credit and its river the Credit River, as it was here where goods were traded or bought on credit. The Mississaugas signed a land treaty with the British Crown on August 2, 1805, ceding all but a one-mile strip on either side of the river. Old Port Credit Village was laid out in 1834 outside the Mississauga reserve, and the Port Credit Harbour Company was formed as a joint venture between the natives and settlers. Two wharves and a warehouse were constructed at the mouth of the river that allowed for goods from the area to be shipped via Lake Ontario. In 1847, the remaining Mississaugas relocated to the New Credit Reserve near Brantford, Ontario. Fredrick Chase Capreol built the first lighthouse at Port Credit in 1863 to attract business to the harbour and hopefully convince investors to purchase some of the 5,700 hecatares of the surrounding land he owned. This pier light was maintained privately and served until being replaced by a government-built lighthouse in the early 1880s. Tenders addressed to the undersigned, and endorsed “Tender for Port Credit Lighthouse,” will be received at Ottawa, up to the Fifth September next, for the construction of a Timber Block, surmounted by a Wooden Lighthouse Tower, at the outer end of the noth breakwater pier at Port Credit, County of Peel, Ontario.Plans and Specifications can be seen and forms of tender procured by intending contractors, at this Department, here, and at the office of the Collector of Customs, Port Credit, and at the Steamboat Inspector’s Office, Toronto. Each tender must be accompanied by an accepted cheque of a Canadian Bank, equal to five per cent on the whole amount of the tender, which will be forfeited if the party declines to enter into a contract. If the tender is not accepted the cheque will be returned. After tenders were received, the Department of Marine realized the amount appropriated by Parliament was insufficient for the work, and a second advertisement for tenders was printed in May 1882 after an additional appropriation had been granted. 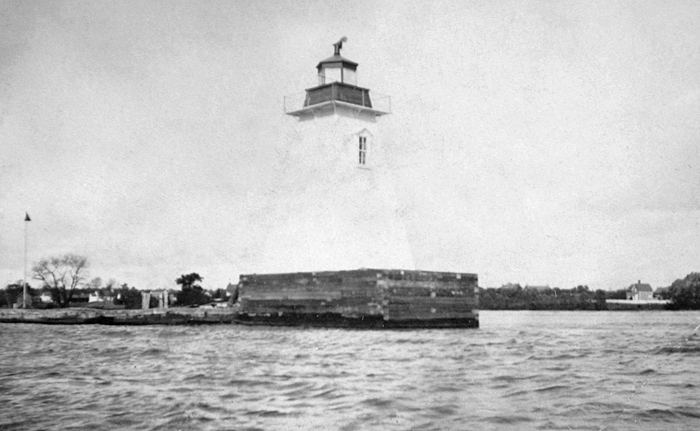 Roderick Cameron of Lancaster was awarded a $1,500 contract for the project, and he had the lighthouse ready to be placed in operation at the opening of the 1883 navigation season. 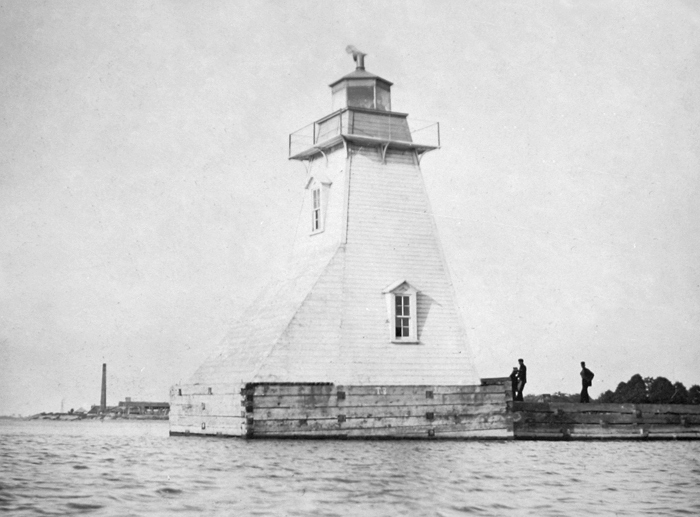 A lighthouse at Port Credit, Lake Ontario, situated on a cribwork block built at the outer end of the north breakwater pier, showing a fixed white light, elevated 37 feet above water mark, visible 11 miles from all points of approach. The tower is a square wooden building, 36 feet in height from the pier to the vane of the lantern, and is painted white. The illuminating apparatus is dioptric, of the sixth order. The sum of $1,946.36 was expended in the construction of this lighthouse. The main expense was the contract for constructing the lighthouse and block, but other significant expenditures included $341.92 paid to E. Chanteloup for the lantern room and gallery and $87.42 paid to Chance Bros. & Co. for an anchor light-lens. Alexander Blakely was hired as the first keeper of the light on November 10, 1882 at an annual salary of $150. At this time, the main industry using the harbour was stonehooking, which had a fleet of twenty-three vessels at Port Credit. During the late nineteenth century, schooners known as stonehookers provided building material for the growing city of Toronto by “hooking” large stone from the bottom of Lake Ontario between Port Whitby and Port Credit. The industry removed an estimated million cubic metres of stone from the lake before portland cement supplanted stone as the preferred building material in the early twentieth century. Keeper Blakely served until 1897, when John Miller, known as one of the jolliest of men, assumed responsibility for Port Credit Lighthouse. Besides minding the light, Captain Miller built and repaired boats with Abram Block, Jr., directed the first Peel Temperance Society in Port Credit, and kept an eye out for those in distress near the harbour entrance. During the night of November 26, 1900, the schooner Augusta, bound for its homeport of Toronto from Charlotte, New York with a cargo of 675 tons of coal, went ashore on rocks one mile west of Port Credit when complications with its steering gear made the vessel unmanageable. The heavy sea swept the Augusta’s yawl boat away, leaving the crew in extreme peril. The following morning, men from Port Credit attempted to reach the schooner, but they were forced to turn back when their boat became half-filled with water. Keeper Miller sent a telegram to Toronto, requesting that the Brittania life-saving crew be dispatched. The lifesavers arrived around 3 p.m., but an issue with their anchor prevented them from getting close, so a volunteer crew of five men launched a small boat from shore into the threatening waves. It took two trips, but the men were able to rescue the captain, mate, three sailors, and the female cook. 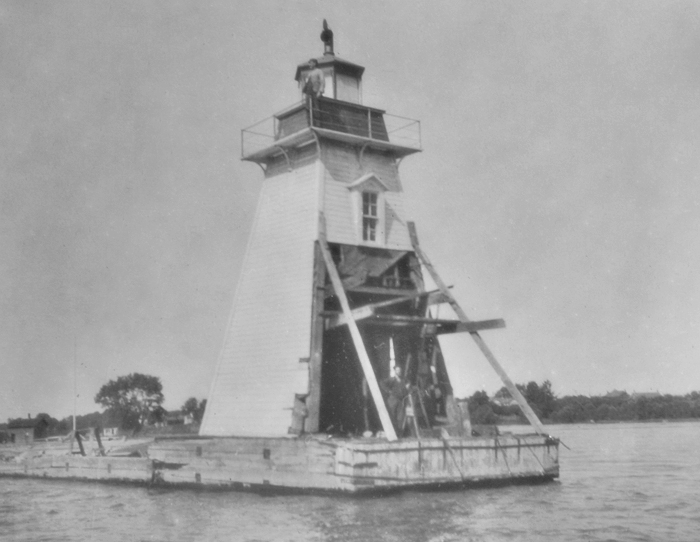 In 1904, Port Credit Lighthouse was remodeled and placed atop a new cribwork block that rose eight feet above the water and a lesser amount above the adjoining pier. The new block raised the focal plane of the light three feet to thirty-nine feet above the lake. J.F. Murphy supervised the work, which was carried out at a cost of $578. Over the years, silt collected at the entrance to the Credit River making the harbour of little value, and at the end of the 1918 shipping season, Port Credit Lighthouse was discontinued. The abandoned wooden lighthouse remained standing until it burned down in 1936. An unwatched light displayed from a steel tower at a height of twenty-four feet was established at the southern end of the north pier at Port Credit in 1952. Two years later, a second light was mounted at a height of fifty-five feet on a pole located 1,775 inland from the steel tower. Together, these two lights formed a range for entering the harbour. Today, lights are exhibited from the outer ends of the east and west stone breakwaters, which form a marina on the northern side of the entrance to the Credit River. Another light is shown from a white cylindrical tower mounted on the bow of the freighter Ridgetown, which was sunk as an extension of the eastern breakwater on June 21, 1974. 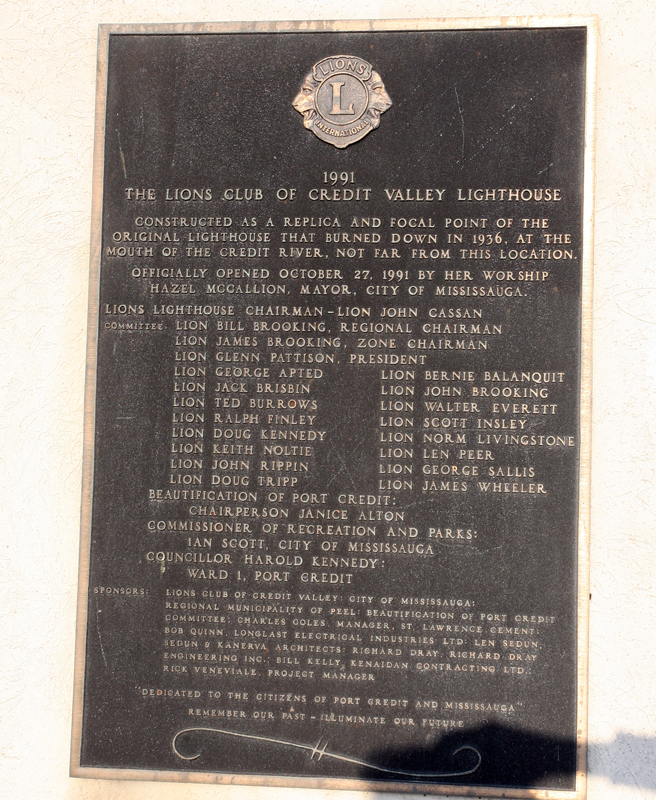 In 1991, the Lions Club of Credit Valley spearheaded an effort to build a replica of the 1883 Port Credit Lighthouse near the mouth of the river. The lighthouse, which is dedicated to the citizens of Port Credit and Mississauga as a reminder of their past and a guide to illuminate their future, was officially opened by the mayor of Mississauga on October 27, 1991. Maintained by the City of Mississauga and known on the Coast Guard’s official List of Lights as Port Credit Inner Channel Light, the square tower is perched above a complex that is home to a pumping station and the Port Credit Business Association. Keepers: Alexander Blakely (1882 – 1897), John Miller (1897 – 1918).